Nothing can shut down a trip faster and more miserably than foot issues. I’m sure all of us have our own war stories from the trail and have seen plenty of others. It’s amazing how much pain and misery a broken toenail or nasty blister can bring, especially when you’re miles from anywhere. Most foot issues come down to two problems: moisture and friction. I’ve learned a lot of useful tips and tricks over years of hiking, backpacking, and trail running that keep my hardworking feet happy. Read on to learn more! Well, after a lot of years of hoping to find one, I’ve concluded that the waterproof boot is a myth. It simply doesn’t exist! Sure, some boots repel water better than others and my Alaska Alpina ski boots do a fairly good job, but no matter how Gore-Tex they are, or how much you spray them with water repellant, water will eventually find its way in. And if you do find a shoe that is nearly “waterproof”, the less it will breathe, which means your feet will sweat and you guessed it, end up wet. 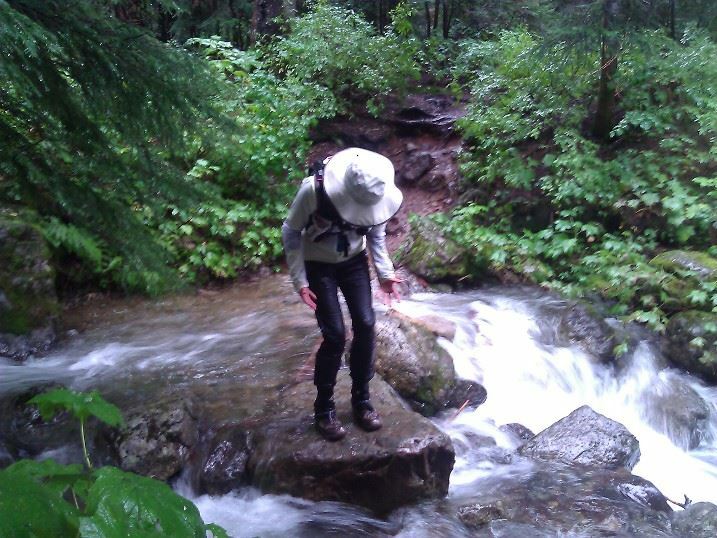 If you’re doing prolonged hiking or running in wet conditions, your feet are getting wet, plain and simple. So what can you do? Stop trying to find that magical unicorn of a waterproof boot, channel your inner child, and simply let your feet get wet. I know, it doesn’t sound fun, but it’s really not as bad as you think. The magic is in how you manage them and keep them warm. The reality of hiking in the PNW. You’re getting wet… plain and simple! And yes, as you can tell from my expression, this was a challenging day because it was wet to the extreme. Use the right sock. Asking people to recommend socks can be a challenging endeavor because everyone has an opinion on a brand and type they like best. Some prefer thick socks, I myself prefer thin. Bottom line is that merino wool or wool blend socks as well as synthetics are all good choices because they wick away moisture, dry fast, and keep your feet warm. My personal recommendations are the WrightSock, Darn Tough and SmartWool. My socks of choice: on the left for warmer weather is the WrightSock CoolMesh II Quarter sock with a patented double layer, which means friction is absorbed by the inner and outer layers of the sock, rather than your foot, successfully preventing blisters. 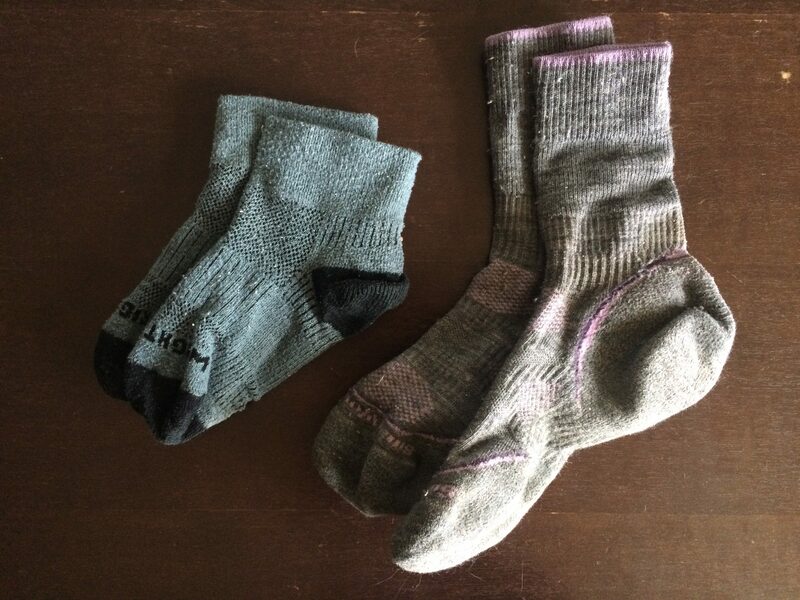 On the right I use SmartWool PhD nordic medium socks and also have a few pairs of taller heavyweight ones for snowboarding and other cold weather activities. Bring sleeping socks. Whenever I backpack I always bring a pair of warm fluffy socks only for sleeping and I keep them in a waterproof stuff sack. Giving my feet 7-8 hours of rest every night in a cozy, dry environment ensures they wake up refreshed. Even if you have wet shoes from the day before, your feet are starting the day in a happy place. Dry your feet often. My biggest priority on the John Muir Trail in 2015 was taking care of my feet. Every 1.5-2 hours I found a nice place to take a trail break and took off my boots and socks, propped up my feet, and allowed them to dry while having a snack. If they were still damp when I was ready to go, I clipped them to my pack and put on a spare dry pair. Granted, this may be tough if not impossible when out in wet weather, but if you do have a chance to remove your socks and shoes and dry your feet, do it! Even if it’s just for a short time, it helps and gives your feet a break. Buy a pair of gaiters. A few years ago I invested in a pair of Outdoor Research Cascadia gaiters. At $70, they were a bit spendy but they’ve been one of the most useful pieces of hiking gear I’ve purchased. Gaiters surround your boot and lower leg and keep out water, sand, snow, and all the general crap that gets into your shoe. They also keep your legs dry and warm and offer some extra bushwhacking protection in the summer months. I highly recommend high gaiters for keeping out snow, water, and general crud. Shorts are not recommended 😉 Bonus? Fleecy leg warmers underneath them! Consider a more porous shoe. I know it seems counter-intuitive, but the biggest issue with waterproof Gore-Tex boots is that when they do eventually succumb to water, they stay wet and are tough to dry. If you use a more porous shoe, they are more breathable and let water pass easily in and out. It means your feet will get wet, but it also means they dry much faster. Though the initial rush of water can be, uh, invigorating, after a few steps it’s amazing how much water squishes out. Just keep hiking or running and pretty soon your feet will feel dryer and warmer, especially with the right socks! My boot of choice is the Merrell Moab Ventilator Mid. I haven’t found a more comfortable fitting boot than this one! They do make a Gore-Tex version, though I prefer the normal boot and it’s breathability. My first pair managed to log over 500 miles. These boots kept my feet happy on the JMT and have logged tons of trail time all over the West. I’m on my 4th pair and wear them even through the winter. On the JMT with my Merrell Moab Ventilators and amazing WrightSocks! I’ve logged thousands of miles with this boot and sock combo! Bring a neoprene sock. Neoprene socks won’t keep your feet dry, but they can keep your feet substantially warmer if you’re really soaked, especially when worn over wool socks. I once did a 5 mile trail run from Goldmyer Hot Springs in terrible winter conditions with 3-5″ of standing, freezing, slushy water on the road. It sucked, but I wore neoprene socks over my usual running socks and while my feet eventually got soaked, the neoprene kept them much, much warmer! Without the socks my feet would have been in a bad situation. The second key to having happy feet is eliminating friction. Any place there is friction, there is likely to be a blister. Make sure your boots or shoes fit. If you already have a go-to sock, wear it while trying on shoes. Make sure your heel doesn’t slide around or up and down. Wiggle your toes. Can you move them? If not, try a shoe with a larger toe box, but make sure they’re not moving side to side and all over the place. Always try your new boots or shoes downhill. If your toes jam into the toe box, find another shoe. Your toes will take a beating that will eventually lead to black nails. Don’t over tighten laces. I can’t tell you how many times I’ve been guilty of this. Many online guides tell you to lace your boots tightly, but don’t do it so tightly that your foot has no breathing room. As you run or hike, your feet will swell a bit, especially if you’re at altitude. Keeping your laces slightly loose or stopping to adjust them from time to time keep your feet happy. Trim your toenails. Whenever I’m backpacking I bring a small pair of clippers and make sure my nails are clipped before I start. Toenails can rub against other toes and snag on your socks, which leads to friction, and you guessed it… blisters! Remove shoe debris. I know it’s a pain to stop and remove your shoes, especially when you’re carrying a big pack, but dirt, pebbles, and debris inside your shoes causes nothing but trouble. Treat a hot spot immediately. Oh yes, I’ve learned this lesson the hard way more than once because I didn’t want to stop, take off my pack, dig out my first aid kit, and tape up a hot spot. A hot spot is a ticking time bomb and will become a blister. Laziness won’t win in this scenario. If you feel a hot spot, stop immediately and tape it. You’ll thank yourself later. For me, moleskin and bandaids never stay put, so instead I use kinesiology tape. It’s thin, soft, flexible, and most importantly, the adhesive seems to get better with warmth, so it stays put, even in wet conditions. Duct tape is always a good fallback, though I find it too bulky and tough to conform, leading to troublesome creases. Kinesiology tape, my tape of specialty for toes, blisters, knees, etc. 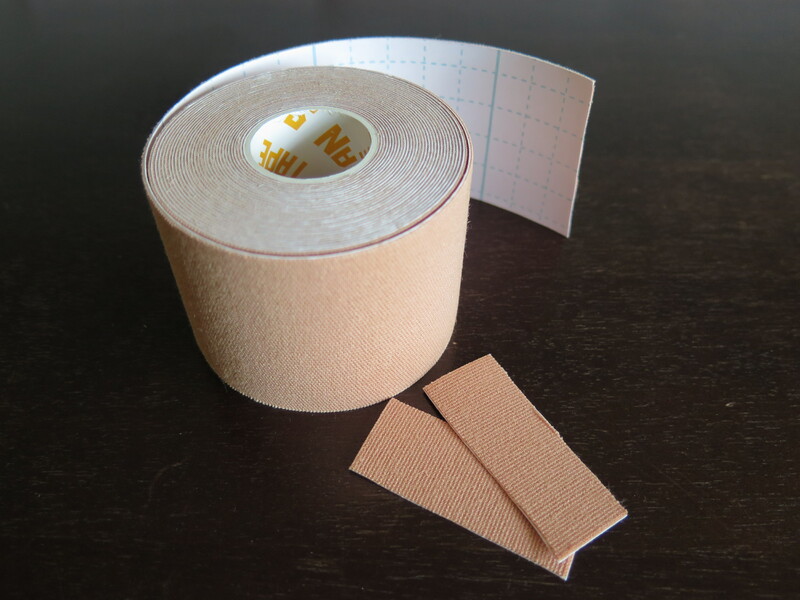 Since I frequently tape my toes, I pre-cut small strips and put them in my first aid kit so they’re ready to go! Tape your toes. My toes sometimes swell and rub together, which can cause annoying blisters. When I hiked the John Muir Trail, I taped my toes off and on with kinesiology tape to reduce friction and keep my little piggies happy. I’ve used this strategy for trail runs and hikes in wet, cold, and hot weather with great results! I frequently tape my toes with kinesiology tape to keep my nails from rubbing and causing blisters. This strategy worked well for me on the John Muir Trail. I love this tape because it’s thin, soft, flexible, and stays put! Oh, and try not to be judgmental about my lack of pedicure 😉 These are hard-working feet! Use a lubricant or powder. Personally, I’ve never had to use a balm or powder but a lot of friends swear by using a foot balm like BodyGlide, TrailToes or Bag Balm. If you use a balm and still blister, try a powder instead and vice versa. Just make sure your powder doesn’t cake up and know that it could interfere with your socks ability to wick moisture. But if it works for you, use it! Socks. Yep, socks again! Socks not only aid in moisture management, but friction management as well. If your socks are creasing, balling up, or causing friction on your feet, try a different pair. After years of hitting the trails, I’ve learned a lot of ways to help keep my feet happy by managing both moisture and friction. I’ve also learned that sometimes having wet feet is unavoidable, so its best to learn how to deal with them. Remember back when you were a kid and you loved puddle jumping? Renew your puddle love! Experiment with lots of socks and other things like powders and/or lubricants. Giving your feet some love goes a long way to happy hiking. And don’t forget to treat them after the adventures with a good hot salt bath or hot springs soak! 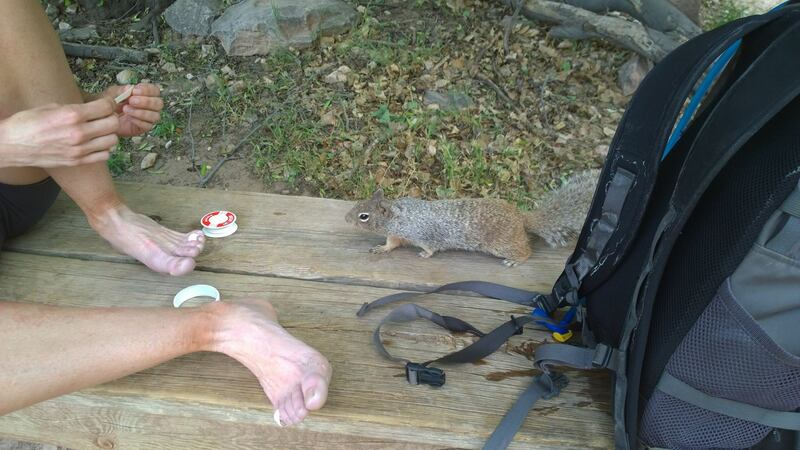 Oh, and beware of trail squirrels. They may try to steal your precious tape! This little dude kept trying to steal my tape while I was taking a pit stop in the Grand Canyon! Sorry buddy, definitely not food!